Red is Asia/Pacific; Blue is Africa; Green is North/South America; Yellow is Europe. Incomes are PPP. Most everyone who’s interested in global inequality has come across the famous elephant graph, originally developed by Branko Milanovic and Christoph Lakner using World Bank data. The graph charts the change in income that the world’s population have experienced over time, from the very poorest to the richest 1%. That’s not much to celebrate, particularly when these gains don’t come anywhere close to lifting people out of poverty. Remember, the poorest 60% - the ones depicted as the “winners” in the elephant graph - continue to live under the poverty line of $7.40 per day (2011 PPP). Suddenly the story changes. It becomes clear that it’s the richest 1% who have gained the most - by far. The incomes of the world’s poor have barely budged by comparison. There is in fact a key difference between the two charts. It all comes down to context. Ravallion’s is in an academic text that is intended primarily for circulation among academics. The inadequate nature of the long-term poverty estimates is well known among academics, who take them with a big grain of salt. Roser’s chart, on the other hand, is an infographic designed for mass consumption on social media. The chart itself – as in the version Gates tweeted – makes no reference whatsoever to the problems with the data. On the contrary, it creates a powerful illusion of certainty. A key piece of my argument has been to say that this is irresponsible public communication. That’s why I say the chart should be taken down. If Roser wants to be clear on what the facts say, then he should refrain from making claims (i.e., about long-term poverty trends) that are not backed up by actual facts. The whole point of my argument is that the data he uses to draw conclusions about global poverty trends from 1820 is in fact not valid for that purpose. Great! So if Roser agrees that higher poverty lines are important to use, then he should stop relying solely on the $1.90 line in his flagship graphs (i.e., the one Gates tweeted). The weight of evidence is clear that $1.90 is not adequate. If the World Bank itself states that it is too low to inform policy, then it’s also too low to inform public debate. A few things about this. First, a higher poverty line doesn’t “deliberately exclude” real progress. That’s a silly accusation. After all, the $7.40 line is not arbitrarily high. It is what researchers say people need in order to achieve basic nutrition and normal human life expectancy. The reason it is important is that it reveals that the small increases in income that Roser’s graph depicts as “progress against poverty” are in fact not adequate for lifting people out of actual poverty. We need to face up to this fact. Second, my point is not only that using the $7.40 line shows that the proportion “fell less rapidly”, as if we’re quibbling about a tiny difference here. No, the argument is much stronger than that. 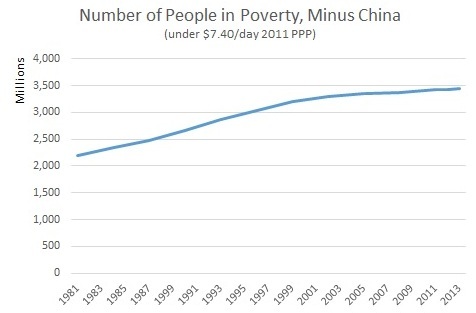 The $1.90 line creates the impression that virtually nobody remains in poverty today (a mere 10%, perhaps), when in reality the increase in income among the world’s poor has been so meager that only a small proportion of people (almost all of them living in China) have actually escaped poverty, while a full 58% of the human population remains poor. As I stated earlier: that’s not progress – that’s a disgrace. The question we have to face is this: is it legitimate to say that the global economy is working when 58% of the human population is in poverty? My answer is a firm no. Matthews and Roser evade this question. Third, to say that incomes have increased from 50c to $2.50 is optimistic. In reality the average gain has been at most a doubling of income since 1980. So people who were living on $1 per day in 1980 are now living on $2 per day - nearly forty years later. That’s what Roser’s graph depicts as “progress”. And once again, while incomes have increased by these tiny amounts, they have not increased enough to raise people out of poverty. Not by a long shot. This is why the Gates narrative is so misleading. Can we call these meager gains “real progress,” as Matthews would have it? 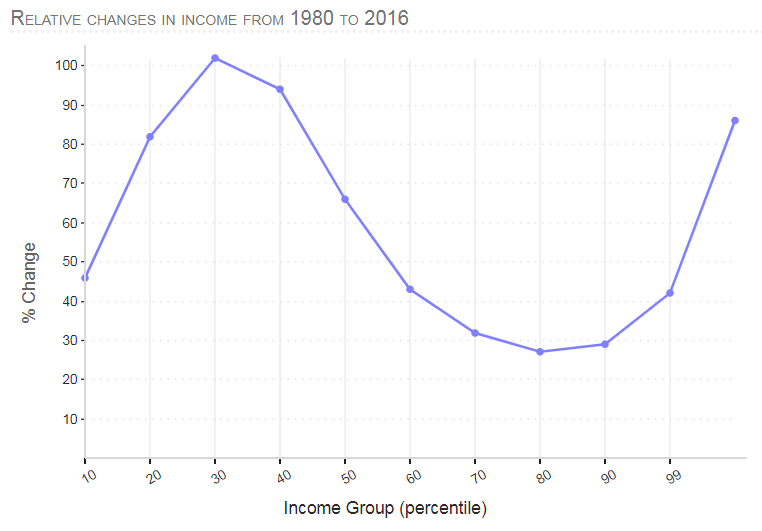 Here is a graph showing how much people’s incomes increased during the period 1980 to 2016, by percentile. Take a look and tell me… “real progress” for whom? It seems a bit absurd to be touting as “progress” the pennies that have trickled down to the poorest when the overwhelming majority of new income since 1980 has been captured at the top. Finally, it’s not that the poor deserve more “help”. What they deserve is a global economy that is fundamentally fairer – that’s the argument I lay out in The Divide. The poorest 58% render underpaid labour and cheap resources for mass consumption and elite accumulation, mostly in the North. It is offensive to suggest that what they need in return is charity. What they need is justice. Sadly, that’s something that the Gates narrative cannot abide. This is a very strange argument, and an exact inversion of reality. In fact it is those who object to the use of absolute numbers that trundle out this argument. They say we can’t use absolute numbers because the only reason the number of people in poverty has been rising is because the poor are living longer, and reproducing. This argument only makes sense if you start from the assumption that poverty is a natural condition – as though being born into poverty is a kind of default. My position is quite the opposite: that poverty is not natural at all, but rather an artifact of policy, and that in a world as rich as ours poverty needn’t and shouldn’t exist. So any additional person in poverty is an injustice – a product of an economic system that has been designed to direct our planet’s abundance disproportionately to the already rich. Matthews eventually gets around to acknowledging this point, but only after first distorting my position. Also, he has said nothing about my initial reason for insisting on absolute numbers, namely, that this is the metric that was first adopted by the world’s governments in the Rome Declaration in 1996. The switch to proportions was made in 2000, apparently – according to research by Thomas Pogge I cited earlier – because it made the goal of “halving poverty” easier to achieve. Matthews says: “What most people in the development field want to ensure is that the people who do exist, however many of them there may be, are as well off as possible. Using percentages is a better approach for that.” This is an assertion, not an argument. No reason is given. And indeed common sense suggests the opposite: that if the goal is to ensure that people who exist (all people exist, by the way) are as well off as possible, then surely we would want the incomes of the poor to increase to the point where they are not in poverty. This goal is served, not hindered, by focusing on the absolute number of people below $7.40/day. No. The point is not just that the data is incomplete, although that is significant. The point (indeed the heart of my argument about the long-term numbers) is that GDP data cannot legitimately be used to assess poverty during a period of mass dispossession. If Matthews and Roser think this is just a debate about what to do with “incomplete data”, they are missing the point. If Roser admits that there is no data for Africa (and precious little for Asia and Latin America) prior to 1900, then why make a graph about “global” trends? Why not just be honest and say the long-term graph is mostly about the rise of GDP in the global North and leave it at that? Again, if you insist on “sticking to the facts”, then stick to the facts. The “hundreds of great research publications” to which Roser refers are the publications that underlie the Maddison database. But - as I have pointed out before - these publications are about GDP, not about poverty, so they don’t help us address the question at hand. Here Roser completely ignores my core argument, and once again fudges the issue (see the second half of this post for more). Now, we do happen to have quite a lot of research about what happened to people’s lives during enclosure and colonization, which illustrates a process of mass immiseration. I have listed some of that research in my posts, and have cited yet more in The Divide. Roser gives no indication that he has any familiarity with it. By invoking “Malthusian” conditions, Matthews is repeating a story that he just assumes to be true. He hasn’t cited a single source for this claim. More importantly, though, Matthews gets his history exactly backwards. Malthus was writing about a population that had already been immiserated by enclosure in England. Their misery was not some prior, timeless condition but rather an artifact of the dispossession that paved the way for industrialization (see Ellen Meiksins Wood). Indeed, Malthus was a conservative thinker who believed, basically, that enclosure was good because it put poor people at the mercy of hunger and therefore made them work harder and become more productive (so as to increase the GDP) - the same argument, incidentally, that the British made when they dispossessed indigenous Americans, and later Asians and Africans. It is not appropriate to use this lens to speculate about the living conditions of people prior to enclosure – whether in England or (even more obviously) the global South. Max Roser and Joe Hasell have written a post defending the methodology behind their long-term poverty graph. It is not addressed to me, but it was written in response to my critique (which you can read here). Unfortunately, their response doesn’t engage with most of my substantive arguments. They do not address the evidence on how the $1.90 line is too low to be meaningful. They call $1.90 “extreme”, which it is – and that is precisely why it should not be used in public communication. Remember, the World Bank has repeatedly pointed out that it is too low to inform economic policy. Why then should it be acceptable for Gates, Pinker and Roser to use it to inform public discussion about economic policy (i.e., whether the global economy is working for the world’s majority or not)? As I see it, Roser should stop using $1.90 in his flagship graphs. Roser and Hasell also do not address the critique, made by Sanjay Reddy and many others, that the PPP baselines that underpin the $1.90 line overstate the purchasing power of the poor. Nor do they address my argument that progress against global poverty is actually worsening, when poverty is measured against our capacity to end it. Roser and Hasell imply that I claimed poor people are getting poorer. I have never said that; that is a straw man. Indeed, I pointed out that the incomes of the poor are going up in aggregate, but – crucially – not enough to raise them out of poverty. That’s what’s at stake. My actual claim was that that the number of people living under $7.40 per day has increased since 1981, and now stands at 4.2 billion people, 58% of the world’s population. It’s not clear to me why this fact has stirred such controversy. Roser and Hasell also take pains to remind us that global GDP is going up. But here again this is a straw man. Of course global GDP is going up! That’s not what keeps me up at night. What troubles me is the distribution of global GDP. In per capita terms, virtually all of it gets sucked straight into the global North, driving a wide and growing gap between the global North and South, as we can see here. Now, to the important bit. The real point of Roser and Hasell’s post is to defend their choice to merge two very different datasets for their long-term graph: Bourguignon and Morrisson (2002) for the period 1820-1970, and World Bank data for 1981 and following. I pointed out earlier that these two datasets measure different things, and cannot be united into a single trend. The B/M data is based on the Maddison database, which was never intended to measure poverty, but rather GDP (“income”) through national accounts. B/M try to estimate the share that goes to households, and then estimate the national distribution, but they are clear (they state it over and over) that this is basically a shot in the dark. The World Bank data, by contrast, is based on household surveys of income and consumption of non-monetary goods and services (including everything from domestic production to gifts to hunting), at least where consumption data is available. I initially characterized this distinction as one between income and consumption. This is a simplification, to be sure – but is commonly used shorthand to describe the difference. Roser and Hasell pounced on it. In defending their use of both measures, they have argued that the Maddison data includes not only income but also non-monetary goods. It might seem that this settles the argument about the long-term trend. But in fact Roser and Hasell have significantly misrepresented the Maddison data. Let’s dig in here. The underlying data that Bourguignon and Morrison use is listed online and available for free at Maddison (1995). There are two important things that stand out. First, coverage. The data on global North countries is rich and robust. Not so for the South. Only 7 pages of this appendix pertain to the three continents of the global South (pages 93 to 99, at the very end). For Asia and Latin America, data for prior to 1900 exists for only three countries each. For Africa there is no data at all prior to 1900, and data for prior to 1950 exists for only three countries. It doesn’t take a statistician to recognize that this is not an adequate empirical basis on which to draw conclusions about long-term global poverty during the period of colonization. The data just isn’t there. There’s no getting around this critique, yet Roser and Hasell have ignored it. Sure, one might speculate on long-term trends in a text intended for academics, while foregrounding the uncertainty and lack of data, as B/M have done. But to create a shiny graph for lay consumption on social media while mentioning none of the uncertainty whatsoever (as in the graph that Gates tweeted) is irresponsible. The World Bank’s PovcalNet suppresses results when survey coverage is too low to be meaningful, so as not to mislead people. So too should Roser. That would be a responsible move. Second, it’s simply not true that the Maddison data counts all non-monetary consumption in the global South, as Roser and Hasell imply. 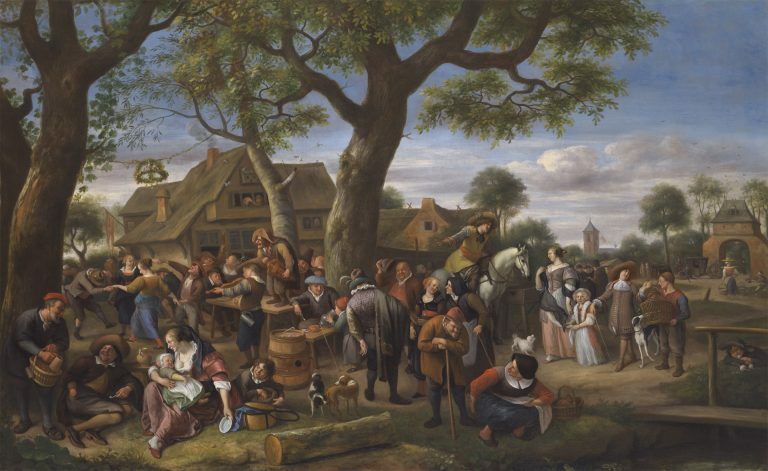 Now, it does count non-monetary GDP – for example, national accounts of grain production, or production from some other industries (typically only those that colonizers were interested in), including when that production happened domestically. But it does not include goods and services gained from commons: game and fodder from communal forests, water from communal irrigation systems, chickens and vegetables raised for domestic consumption, help from neighbours, etc… in other words, nothing that is not normally captured in national accounts (or any official accounts of commodity production). In this sense, the Maddison data is fundamentally different from the data that is gathered from household surveys. There’s no getting around it. Roser and Hasell try to muddy this distinction, misleading people into believing that the two datasets are basically the same. They are not. Branko Milanovic, the world expert on this question, makes this clear here. This is important when it comes to measuring long-term poverty, because the period 1820-1950 covers a period of enclosure and mass dispossession under colonialism across the global South. Take the case of India, for example. In the 19th century, the British went about enclosing communal forests (which they used to build their navy), privatizing communal waterways, destroying communal granaries, etc. The goal of these policies was explicit: to put farmers at the mercy of hunger so that that they would have no choice but to intensify agricultural production for export (to London) if they wanted to survive. And it worked: grain production went up, exports rose. This is reflected in the national accounts. But during this very period, from 1876-1902, 30 million Indians starved to death as a result of British policy. Life expectancy collapsed by 20% from 1870 to 1920. Why? Because people had been stripped of commons they had traditionally depended on. Think about it this way. If you enclose a forest and sell it for timber, GDP goes up. But this accounting tells us nothing of what the local community loses in terms of their use of that forest. Nothing. The loss is swept under the statistical rug. That’s what gets left out of Roser’s graph. The story of colonization and the impact it had on the livelihoods of the colonized is elided, repackaged as a narrative of progress. Roser is not really to be blamed for this. He works with statistics, and none of this is captured by statistics. But there are disciplines that do speak to this question. Economic anthropology, in which I am trained, has for more than a century described how pre-capitalist economies work – describing how people have managed commons, how they have organized gift exchange and systems of reciprocity, etc. If we want to understand what happened – and what was lost – during the forced transformation from subsistence economies to capitalist ones, we need to pay attention to that research. A final thought. Roser and Hasell imply that I have “dismissed” the hard work of studious researchers. I have done no such thing. I respect the work they have done; I know how difficult it is. My argument, rather, is that the results of that research are simply not robust enough to draw the conclusions that Roser draws, and which Gates and Pinker have trumpeted. Indeed, they were never intended for that purpose. We don’t need to be afraid of this critique just because it threatens a long-familiar story. What we need is to tell better, more accurate stories. That’s how science progresses. So, this is my plea. Take the graph down. It’s time to stop using it. Or, if it must be kept up, this is what needs to change (and I have stated this to Roser and Hasell directly). Every time the graph appears, it needs to foreground (a) that the two underlying methods are different and not comparable; (b) that the data for prior to 1950, and specifically prior to 1900, is extremely thin for the global South and not robust enough to draw strong conclusions; and (c) that the data does not capture the impact that colonization had on people’s livelihoods. That shouldn’t be too difficult. Roser’s tweet referred to an interesting blog post by Joe Hasell, with a graph illustrating the change in the Gini index within countries from 1990 to 2015. Countries above the 45-degree line have seen rising inequality, while countries below the line have seen falling inequality. It’s a pretty even split (although the majority of the world’s population live in countries that have seen rising, not falling inequality). This seems like good news indeed. So which is it? Is inequality getting better or worse? What Roser doesn’t mention in his tweet is that the Gini index used here is a relative measure. If the incomes of the poor increase at a faster rate than the incomes of the rich, the Gini index shows a decline in inequality even if the absolute income gap between the rich and poor continues to widen. Hasell is aware of this issue, however, and mentions at the end of his post that calculations of absolute inequality suggest that inequality has been increasing over the same period. So what’s going on here? Imagine that person A has an income of $1 per day while person B has an income of $100 per day. If A’s income grows by 100% (to $2) while B’s income grows by only 90% (to $190), the Gini index shows that inequality is decreasing even though the absolute gap between the two has increased substantially, from $99 to $188. We can correct for this by using the absolute Gini: simply take the Gini index and multiply it by the average income of each country. Doing so gives us a very different picture of inequality. The graph below shows that the vast majority of the world’s countries have seen increasing absolute inequality from 1990 to 2015. Click through to explore an interactive version developed by Huzaifa Zoomkawala in conversation with Hasell and me. There are various ways to calculate the absolute Gini. One can use Gross National Income (GNI) per capita, measured in either constant or PPP terms, or - to be more consistent with the underlying Gini data from Povcal - one can use mean income as captured by household surveys (as in the image above). The interactive graph gives users the option to pick between these various multipliers. But no matter which one you pick, the conclusion is the same: absolute inequality has been getting worse virtually everywhere. These results are in keeping with recent research showing that the absolute Gini increased for the world as a whole as well as in most world regions from 1975 to 2010. Keep in mind that the graph above is represented on a logarithmic scale. The linear scale (the default option on the interactive graph) has poor countries clumped together in the bottom left with rich countries soaring away. This skewed distribution is due to the vast differences in average incomes between countries, and illustrates the significant inequality that continues to persist between Western countries and the rest of the world. There is no “correct” way to measure inequality. Both relative and absolute measures are important. For some reason the relative measure has become the most dominant by far (i.e., in the work of Branko Milanovic and in World Bank reports). But it is misleading to develop a narrative about inequality using the standard Gini index without (a) stating that it is a relative measure, and (b) providing the absolute measure for comparison. This is important, because in my experience when most ordinary people (i.e., non-experts) think about inequality, they think of income gaps instead of ratios. I tested this recently with an online poll that gave respondents the chance to explain, in their own words, what they think when they hear someone say that inequality is “getting worse” or “diminishing”. Among 174 respondents, the vast majority (some 95%) indicated that they think of inequality in absolute terms. This needs more formal research, of course; but if these preliminary results are anything to go by, then we risk seriously misleading the public by telling them that inequality is decreasing when in fact, according to common sense definitions, it is getting worse. Yesterday I stood in the hall of the Durham Union to argue for the proposition: “This house believes Britain owes reparations to its former colonies”. The following is the text of my ten-minute speech, followed by five brief reflections on the opposition’s arguments. I still remember the first time I taught colonial history at the LSE. LSE students are among Britain’s finest: they graduate from top schools, perform brilliantly on their A-level exams. And yet when I gave a lecture about the Indian famines of the late 19th century to a classroom full of third years, I was met with blank stares. As a direct result of British policy, 30 million Indians died needlessly of hunger between 1875 and 1902. Laid head to foot, their corpses would stretch the length of England, from Dover to the Scottish borders, 85 times over. No one in the classroom had ever heard of it. And this tragedy was not an isolated incident. There were many more. The Great Bengal Famine in 1770 killed 10 million people, one third of the region’s population. Here too historians blame British policy: brutal tax collection, enclosure of forests and waterways, forcing farmers to rip up their rice to plant crops for export. Similar policies imposed over the following decades claimed the lives of another 22 million people, all while record agricultural exports were being siphoned away to London. Historian Mike Davis has famously likened these famines to the holocaust. And yet the corpses that the British left strewn across India have been almost entirely forgotten. Tell me: would we ever tolerate such amnesia when it comes to the crimes of Nazi Germany? Never. Any such ignorance is rebuked, and rightly so. Yet when it comes to the crimes of the British Empire, an insidious form of holocaust denialism vipers right through our culture. While he was Prime Minister, David Cameron went on record saying: “There’s an enormous amount to be proud of in what the British Empire did.” Why? Because the British brought “development” and whatnot. Or so the argument goes. But there isn’t a shred of evidence to back this up. During the entire 200-year history of British rule in India, there was zero increase in per capita income. In fact, during the last half of the 19th century—the heyday of British intervention—income in India collapsed by half. The average life expectancy of Indians dropped by a fifth from 1870 to 1920. India wasn’t “developed” under British rule – it was de-developed. And not just in terms of social welfare. British policy was designed to destroy India’s domestic industries by imposing asymmetrical tariffs, by dismantling the institutions that trained up producers, and in some cases even by maiming skilled artisans – all to create captive markets for British goods. During the course of British rule, India’s share of the global economy shrank from 27% to 3%. What a strange twist of reason this requires. Democracy? British rule was dictatorship! Africans and Asians struggled and bled for the right to vote in their own countries. Property rights? The whole point of colonialism was dispossession—securing the rights of the colonizers to the property of the colonized: land, gold, diamonds, taxes, even the bodies of the colonized themselves. Rule of law? The object of colonial legal codes was to deny equal rights to colonial subjects. And India’s railroads were used to pump resources—grain and timber—out of the hinterlands to the ports for British use. Even if we accept that useful things were shared during colonialism – universities, for instance – that is not the same as saying they were a benefit of colonization. Colonialism is not a necessary vector for the transfer of knowledge or technology. Britain has long enjoyed the Arabic numeral system, algorithms, and even algebra itself, without ever submitting to Arab invasion. It takes a warped mind to believe that the best way to share ideas with other humans is to colonize them. But we have barely scratched the surface. Let’s not forget that Britain’s first forays into colonialism were linked to the consummate expression of barbarism: the Atlantic slave trade. 300 years of state-sponsored human trafficking. 14 million souls shipped across the sea. Countless bodies shackled to British plantations and churned into the sugar and cotton that fueled Britain’s industrial rise. And yet in the book I was made to read to become a British citizen, this long, dark history was reduced to three sentences. You can visit Glasgow, Bristol, London, Liverpool and every other British city that grew rich on the slave trade without encountering a single memorial. Denialism vipers through our culture. We could spend all night listing off Britain’s crimes against humanity. But that is not the point I want to make. This is not just about a list of crimes. The denialism runs much deeper than that. You see, we have this story we tell ourselves, that Britain’s crowning moment of greatness, the Industrial Revolution, emerged sui generis from within Britain’s borders – robust institutions, good markets, advanced science and technology. This is the story that’s written into our children’s textbooks: we must all be proud of Mr. James Watt and his inventions. But scholars remind us that there is much more to the story than we are normally told. From historians like Sven Beckert, Kenneth Pomeranz, Ellen Wood, Parthasarathi and Karl Polanyi, the evidence is clear: the Industrial Revolution was built on state violence, slavery and colonization. Britain’s economic rise depended on cotton, sown and harvested by enslaved Africans on land expropriated from indigenous Americans; depended on the theft of agricultural products from Indian farmers; and depended on the forced de-industrialization of Asia. But, I can hear you say, that was all in the past. It ended more than 70 years ago. Things are different now. Are they? Only if you’re willing to forget what happened afterward. Only if you’re willing to forget the British-backed coup that deposed Mohammed Mossadegh, the first elected leader of Iran, when he tried to regain control of the country’s oil reserves from Britain. Only if you’re willing to forget the British-backed coup that deposed Kwame Nkrumah, the first elected leader of Ghana, when he sought to reduce his country’s dependence on British imports. Only if you’re willing to forget the structural adjustment programs that Britain helped impose across its former colonies in the 80s and 90s, one after the other, reversing the progressive policies of the postcolonial era to restore British access to cheap labour, raw materials and markets, devastating the livelihoods of ordinary people in the process, adding hundreds of millions to the ranks of the poor. But we’ve forgotten all that. And we’ve forgotten much more besides, including things that are happening right now. We’ve forgotten that the City of London operates at the center of the world’s tax haven network, which helps facilitate illicit financial flows that cost the South more than $1 trillion per year. Colonialism may be over, but the system that it created – a system designed to siphon wealth from South to North – remains very much in place. The word “reparations” suggests that the problem is in the past. It is not. So go ahead – I challenge you: chalk up the billions of hours that enslaved Africans worked on British plantations, pay it at a living wage. Tally up compensation for the 60 million souls sacrificed to famine for the sake of British surplus. Boost it all by 200 years of compound interest, and add that to the trillions lost during structural adjustment and the trillions more in stolen cash that flows through Guildhall. Try it. The numbers begin to swell. They rise like a chorus of voices from the forgotten corners of our past. They march like an army of ghosts who demand a reckoning. And then it strikes you…. Then it strikes you that there is not enough money in all of Britain to compensate for these injustices. And you realize, that if Britain paid reparations – real, honest, courageous reparations – there would be nothing left. Britain would not exist. And that is exactly what people find so terrifying about the question of reparations. It’s not that they fear the actual prospect of paying. It is that even just thinking about what is owed reveals the hard truth: that what is owed, is everything. But really, this is not about the money. This is about something far more important… this is about the story. The real reparations we need are narrative reparations. So this is what I ask of this house tonight – that we demand, at minimum, repair of the broken story we tell ourselves: an end to the denial that has festered among us for too long. Let us demand the truth be told in our schools and in our town halls. Let us demand that alongside every statue celebrating Victoria and Churchill there be memorials to their victims. Let us demand that the real story of Britain’s rise be worn like poppies upon our breasts. As Aime Cesaire put it, “A nation which colonizes, a civilization which justifies colonization, is a sick civilization, a civilization that is morally diseased.” So what is at stake here, in the end, is not only justice for the dispossessed, but Britain’s own healing. Britain’s own humanity. To repair this broken story will cost you nothing, and yet you have everything to gain. Photo taken in 1876-1879, India. My opponent, John Hemmings, responded with a number of common arguments that are worth exploring. I paraphrase and reflect on five of them here. In a way, this exactly proves my point. We all know about the crimes of Mao and Stalin – in fact, they feature routinely in our media narratives. They are wielded as proof that totalitarian communist regimes are horrible and destructive – in stark contrast to the supposedly liberal capitalism promoted around the world by a supposedly benevolent Britain. And it’s true, totalitarian communism was disastrous. But that’s no reason to pretend that the history of capitalism wasn’t itself brutally violent: from enclosure to the slave trade to colonization to famine – why is our narrative about Western capitalism so routinely sanitized of these core elements? That is what we need to repair. You certainly won’t find a defense of these past empires on my lips. I am a staunch anti-imperialist, and always will be. Give me a chance to broaden my argument, to critique empire itself, and I will gladly do so. But two points. First, the proposition in question has to do with Britain – that is what’s under debate. So this is a red herring. Second, the Mongols did not design a global economic system that remains in place today. Britain did – and this is precisely the core of my argument: that there is a fundamental continuity between the international economic system that was consolidated from 1600 to 1950, and the one that exists today. There are some obvious signs of this. Who controls the World Bank, the IMF and the WTO, the three key institutions that govern the rules of the global economy? Voting power in the WB and IMF is monopolized by a small handful of rich nations: the US, Britain, France, Germany, Japan. Meanwhile the global South, which has some 85% of the world’s population, has less than 50% of the vote. In other words, even if the vast majority of the world voted to change WB and IMF policy, they would not be able to do so. What about the WTO? Bargaining power in the WTO is determined by market size, so economies like Britain virtually always get their way. In other words, the inequalities that were generated during the colonial era now structure who has power in the global economy. Inequality begets inequality. This is hardly surprising. Remember: the Bretton Woods institutions were founded in 1944, before the end of colonialism. That’s why colonies like India were integrated into the system on profoundly unequal terms. Indeed, that was the whole point. The claim that corruption is a major cause of continued poverty in the South is a common one. John invokes the Corruption Perceptions Index that is published by Transparency International each year, which shows the global South smeared in the deep red that depicts high levels of corruption, while Britain and other rich economies enjoy the bright yellow that suggests no corruption at all. Let’s think about this more carefully. Is corruption a problem in the South? Definitely! But two points. First, many of the South’s most corrupt regimes were installed by Western powers, quite often after deposing democratically elected leaders: Pinochet, Mobutu, Idi Amin, the Shah of Iran, a number of military juntas across SS Africa and Latin America… and then France’s massively corrupt Francafrique strategy to hand-pick the presidents of Francophone Africa in the post-independence era in order to guarantee continued access to the region’s resources. Tell me, which is more corrupt? The petty dictatorship, or the superpower that installed it? Of course, this doesn’t explain all corruption – far from it! And it’s true, corruption costs the South a tremendous amount of money: some $60 billion per year, according to the World Bank. But compare those losses to the losses sustained by the South at the hands of corporate tax evasion and illicit financial flows – some $1 trillion per year, according to Global Financial Integrity. And this system is facilitated by a shadowy network of tax havens and secrecy jurisdictions that is almost entirely controlled by rich nations, with about half of it controlled by the City of London. If this isn’t corruption on a grand scale, I don’t know what is. So why does Britain suffer no accusations of corruption by Transparency International? Because we don’t perceive Britain as corrupt. It’s not part of our story. That’s why our story – as I have been at pains to point out – needs to be fixed. (Sources here). Again, colonization is not a necessary vector for the transfer of knowledge and infrastructure. It is obscene to believe otherwise. One can build universities without colonizing other countries – indeed, it is done regularly today. But more importantly, the idea that there was some kind of “net good” that came out of colonialism is deeply disturbing. Even if there was some kind of empirical evidence for this, it is a chilling calculus. As if erecting universities somehow justifies 200 years of violent dispossession; as if the Victoria Memorial stacks up against 60 million corpses. Consider this. As Aime Cesaire has argued, the logic of colonization was fundamentally similar to that of Nazism: an expansionist project built on racial hierarchies. It is telling that, in public discourse, one can be “nuanced” about the legacy of colonialism but not about the legacy of Nazism. It is impossible to imagine a British politician or pundit arguing that there were some good things that came out of Nazism. Even if there were, we would never use that to soften our horror at Nazi violence. Why the double standard? Only a jury committed to preserving the absolute rights of patriarchy would ever acquit such a man on these grounds. So too, only those who on some level presuppose European supremacy would ever acquit Britain on the grounds of some kind of “net good” argument. The narrative of aid is precisely the opposite of the narrative I have called for. The aid narrative goes like this: Britain became rich because of its own brilliance and hard work and good institutions, and now reaches out across the chasm to give generously of its surplus to poor countries, helping them up the development ladder. This story presupposes a fundamental disjuncture between the wealth of rich nations and the poverty of poor ones, as if the two have nothing at all to do with one another, either historically or today. In reality, the aid that the North gives to the South is vastly outstripped by financial resources that flow the other direction, in the form of interest on external debt, profit repatriation, illicit financial flows and so on. In fact, for every dollar of aid that the North gives to the South, the South loses up to $24 in net outflows because of how the global economy is structured. The South is a net creditor to the North. Poor countries are effectively developing rich countries, not the other way around. The aid narrative obscures this reality. It makes the takers in the system seem like givers, and grants them a kind of moral high ground. It prevents us from understanding how the global economy actually works, and directs our attention away from the real root causes of poverty and inequality. That is precisely the illusion that we need to correct. We need a more honest story of how our world came to be as divided as it is today, and why that divide persists. This brings me to a final point. If the question is how Britain can best help poor countries, the answer is simple: by working to make the global economy fundamentally fairer for the world’s majority. Democratize the World Bank and the IMF and the WTO, put an end to structural adjustment conditions on finance, close down the tax havens, roll out a global minimum wage. Once again, the concept of reparations assumes that the injustice is in the past. It is not. It persists today, in the form of a profoundly inequitable and undemocratic global economy. Any rational call for reparations must begin with a demand for justice now. *For a more complete articulation of all of the points above, see The Divide. Last week Foreign Policy published an article I wrote titled “Why growth can’t be green.” It stirred a lively online discussion – and of course attracted dissenters. Among them was one Noah Smith, who penned a critical op-ed in Bloomberg. You can read it here. I wrote to Noah and asked whether he would let me respond on the same platform, where he contributes a regular column. To my delight, he agreed. So I pitched to his editor, copying Noah. But I received no response. Perhaps he’s less interested in the debate than he initially let on. Poor form, by my lights – but oh well. Here are some of the points I would have made. The main problem with Noah’s piece is that the whole thing is based on either awkward confusion or intentional sleight of hand. My argument in FP was that it is impossible to achieve absolute decoupling of resource use from GDP on a global scale, even with rapid efficiency gains and aggressive taxes on resource extraction. This is the conclusion reached by literally every existing study that has been conducted on the matter (you can follow links to the original research here). The reason is simple: the rate of decoupling is outstripped by the normal rate of GDP growth, even in high-efficiency scenarios. To make matters worse, there are physical limits to resource efficiency, and as we approach them the rate of improvement slows down, giving yet more force to the scale effect of GDP growth. In an era in which we are already dramatically overshooting the planetary boundary on material footprint, this means that aggregate global economic growth cannot continue if we want to avoid chewing through the web of life on which our civilization depends. There’s no question that we are making rapid gains toward renewable energy. Unlike resource use, GDP can (thankfully) be dramatically decoupled from carbon emissions. But this solves only one dimension of our ecological poly-crisis. Even if we magically switched to a completely clean and renewable energy system tomorrow, we would be no closer to reversing our overshoot of all the other critical planetary boundaries: biodiversity collapse, chemical loading, deforestation, etc. Think about it. What are we going to do with all that clean energy? The same things we’re doing with fossil fuels: raze forests, intensify agricultural extraction, produce mountains of stuff, send waste to landfill – and do all of this at an ever-increasing rate, because our economic system is programmed to require endless expansion. This paradox is brilliantly captured by Joan Wong’s illustration for the FP: a solar-powered civilization that has nonetheless laid waste to the planet. Noah is concerned that if we were to stop global growth, poor countries would be “stuck” at their present level of poverty. But I have never said that poor countries shouldn’t grow – nor has anyone in this field of study (which Noah would know had he read any of the relevant literature). I have simply said that we can’t continue with aggregate global growth. What we need, then, is a fairer distribution of global income, with much more of it going to poor countries (and poor people within rich countries). If we share what we already have more fairly, we won’t have to plunder the earth for more. But then Noah switches tack, acknowledging this point but saying that a fairer distribution of global income is politically and logistically impossible. Logistically impossible? Hardly. I can think of lots of ways to do it: by introducing a global minimum wage, for instance, or by democratizing the institutions of global economic governance, or by allowing poor countries to use subsidies and tariffs without fear of brutal retaliation, or by cancelling unpayable debts, or by rolling out a world basic income. I discuss all of this and much more in The Divide, along with practical ideas for how to make it happen. Is it politically impossible? Well, it would certainly require a struggle. But it’s far less impossible than Noah’s preferred alternative, namely, to transcend the laws of physics. First, population can’t grow without limit, for the same reason that GDP can’t. It’s silly to imagine otherwise. Still, I take the point. But see #2 above: no one says that poor countries can’t grow their economies. Yet more importantly, the real cause of lower fertility isn’t higher GDP but rather better girls’ education. GDP is a confounding factor. In Cuba – which has a high education index and strong gender parity – the fertility rate is only 1.6 births per woman. GDP per capita is $7,000. Saudi Arabia’s fertility rate is much higher, at 2.7 births per woman, despite a per capita GDP that is three times that of Cuba, and double the “magic” threshold of $10,000. This brings me to a crucial point. While poor countries may need some GDP growth, that should never – for any nation, rich or poor – be the objective as such. 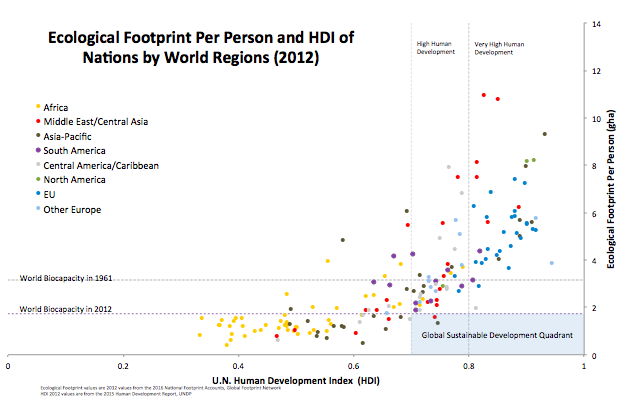 The objective should be to improve human well-being: better health, better education, better housing, happiness, etc. The strategy should be to target these things directly, without blindly hoping that GDP growth will somehow magically deliver the results we want (usually it does not: the vast majority of new income from growth goes to the rich). To the extent that achieving these goals entails some growth, so be it. But that’s quite different from saying that GDP needs to grow forever. Noah seems to believe that shifting the economy from goods to services will help reduce the material intensity of GDP. Happily, this relationship is already accounted for in the models I cited. To be fair, though, it’s easy to miss if you’re not reading closely. Plus, it seems like a reasonable assumption – and it frequently appears in green-growth rhetoric. Unfortunately, the data do not support the theory. As a proportion of world GDP, services have grown from 66% in 2002 to 68% in 2013. But during this same period global material use has continued to rise, and indeed its rate of growth has accelerated to the point of outstripping the rate of global GDP growth. The same is true of rich nations as a group. Services represent more than 74% of GDP in rich nations (a share that has grown rapidly since the 1990s), but material footprint growth is nonetheless outpacing GDP growth. Why is this? First, because services require resource-intensive inputs. Consider the airline industry, or the tourism industry. These are services, but of course rely on a massive material base (airports, resorts, roads, buses, etc.). Second, the income that people earn from selling services gets used to buy resource-intensive consumer goods. So you might earn your salary as a banker (or an op-ed columnist) but spend the money buying cars and yachts and televisions. Third, it may be that the resource intensity of primary and secondary sectors has increased to the point of outstripping any gains made by switching to services. Either way, there is no evidence that relying on a switch to services, in and of itself, reduces the material throughput of the global economy. Let me conclude by circling back to Noah’s argument about energy. Noah says “Since about 1990, emissions from the U.S. and EU have fallen, while emissions from developing countries, especially China and India, have exploded.” First, a note of caution. Noah relies here on territorial emissions, but what we really need to look at is consumption-based emissions. The US and EU have outsourced much of the production of the goods they consume – and therefore their emissions – to the global South, particularly to China. That needs to be accounted for. Furthermore, it just doesn’t make sense to compare China and the US/EU in terms of total emissions. Emissions need to be judged on a per capita basis. By that metric, China’s emissions are significantly less than emissions from rich countries. But here is the more important point. While we obviously need to throw everything we have into shifting to a renewable energy system, it is unlikely that we will be able to do this fast enough to keep us from blowing the carbon budget for 2C (which, on our present trajectory, is only 19 years away). Consider this. Rich nations need to cut their emissions by more than 10% per year, starting now. If rich nations continue growing at the present average rate of 1.86% per year, that means decarbonization needs to happen at a rate of 13.2% per year. For perspective, this is seven times faster than the historic rate of decarbonization in rich nations (which has, incidentally, been slowing in recent decades), and exceeds the decarbonization rate implied by the average G20 Nationally Determined Contributions under the Paris Agreement by a factor of four. There is no existing evidence that suggests that improvements in technologically efficiency alone will allow us to decarbonize fast enough to stay within 2C. Why? Because the scale effect of growth is wiping out most of our gains. We need all the technological innovation we can get - but it will only really start to work once we stop blindly marching up the ever-rising exponential curve of GDP. Once we reach the limits of efficiency, pursuing any degree of economic growth drives resource use back up. *This article and image originally appeared in Foreign Policy magazine in 2018. Last week Twitter erupted in a heated debate about global poverty. The question was whether it’s better to measure our progress against poverty (or lack thereof) by looking at the total number of people in poverty or by looking at poverty as a proportion of the world’s population. Over the past few decades, the proportion of people living under $7.40/day, which is the minimum necessary to achieve basic nutrition and normal life expectancy, has fallen from 71.8% in 1990 to 58.1% in 2013. Not a great improvement, but certainly some progress. But if we look at it in terms of absolute numbers, a very different story emerges. The number of people living under $7.40/day has grown from 3.78 billion in 1990 to 4.16 billion in 2013. With numbers like that on the table, it’s hard to escape the conclusion that there’s something wrong with the progress narrative. As the debate continues, it’s clear that there is no single simple narrative we can tell about progress against global poverty. I have argued that absolute numbers matter because that's the metric that the world’s governments agreed to focus on when they first pledged to tackle poverty in the Rome Declaration. But both measures are analytically important; they tell us different things about the world. There is a third approach, however, proposed by Yale philosopher Thomas Pogge. Pogge argues that the morally relevant metric of progress against poverty is neither absolute numbers nor proportions, but rather the extent of global poverty compared to our capacity to end it. By that metric, he says, we are doing worse than at any time in history. Is he right? And, if so, is there some way to demonstrate this with hard data? The first step is to measure our relative capacity to end poverty. One conceptually easy way is to determine the cost of lifting everyone above the poverty line (the "poverty gap" as calculated by the World Bank) as a percentage of total global GDP (in constant 2011$ PPP). Then we can compare that metric against the actual extent of global poverty (using proportions, to be generous to my critics), and chart the change in this relationship over time. So if the poverty rate stays the same while our capacity to end it doubles, then the moral egregiousness of poverty is twice as bad as it used to be. And if the poverty rate improves by a factor of two while our capacity to end it stays the same, then the moral egregiousness of poverty is half as bad. Let’s flesh this out with some real-world figures. In 1990, it would have cost 10.5% of world GDP to lift everyone above the poverty line. In 2013, it would have cost only 3.3%. Our capacity to end poverty has improved by a factor of 3.18. 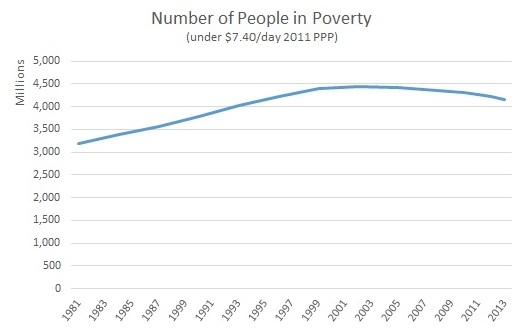 Meanwhile, the poverty rate has improved only by a factor of 1.23. 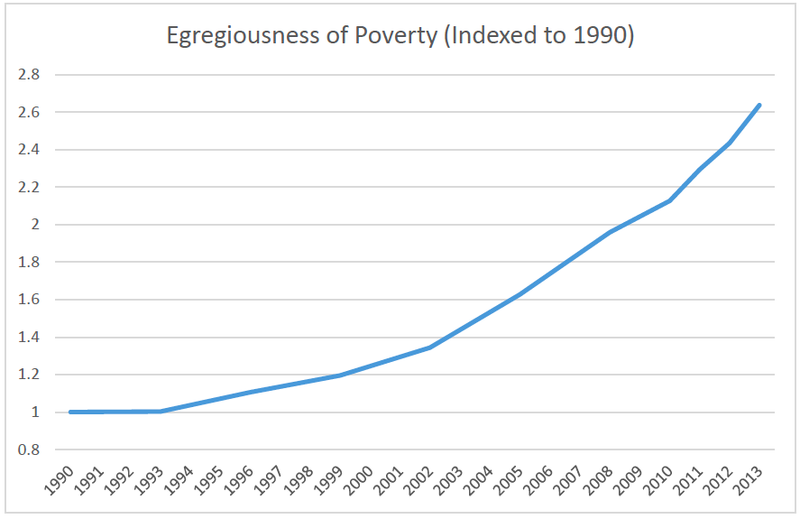 This means that the moral egregiousness of poverty is 2.58 times worse than it was in 1990. Pogge is right: by this metric, poverty is worse now than ever before. Our world is replete with unprecedented riches, and yet we cannot ensure that everyone has a decent basic share of it. Morally, we have regressed as a civilization. But this is a crude way to think about our capacity to end poverty. We shouldn’t be looking at the cost of ending poverty as a percentage of total world income, but rather as a percentage of the income of all the people who are not poor; say, those who live on more than double the poverty line. In 1990, it would have cost 12.9% of their total income to end poverty. In 2013, it would have cost only 3.9%. According to this measure, our capacity to end poverty has improved by a factor of 3.31. By this method, the moral egregiousness of poverty is 2.69 times worse than it was in 1990. The difference between the two results is due to increasing global inequality; because the incomes of the global rich have grown more than the incomes of everyone else, the cost of ending poverty is a faster-shrinking share of their income compared to total world income. The numbers above are all rounded off for easy reading, and so you can repeat the calculations yourself. The graph below is based on the actual figures associated with the second method (all data is derived from the World Bank). It gives us a visual depiction of the egregiousness of poverty since 1990. We live in an age where more than 4 billion people – some 60% of the human population – live on less than what is required for meeting basic human needs. This is a ringing indictment of the global economy by any standard. But it is particularly unjust given that their suffering could be ended with only 4% of the income of the world’s richest quintile. Such a transfer could be made either directly, with progressive taxes on financial transactions, wealth, carbon, resource extraction etc, or – better yet – by changing the rules of the global economy to make it fairer to poor nations: democratizing the World Bank and IMF, cancelling unpayable debts, rolling out a global minimum wage, ending structural adjustment conditions on finance, etc (see Chapter 8 of The Divide for more). *I’ll be working on refining this method further, testing different thresholds, and exploring national-level results. If you have any suggestions, please feel free to share them either through my contact form or in the comments below. Technical notes: (a) The poverty data is notoriously messy, so this needs to be taken with a grain of salt. One potential problem is that at very low levels, poverty is defined according to consumption rather than income as such, so it is a bit tricky to compare this to global GDP. (b) In many contexts people who earn more than $14.80 per day are still very poor; obviously it would make little sense to “tax” them in order to improve the incomes of those who are even poorer. The transfer should be borne by the rich on a progressive scale. (c) This metric may be over-sensitive to the difference between the proportion of people living in poverty vs the poverty gap. One can imagine a scenario where 4 billion people are only 5% under the poverty line; the proportion of people in poverty would be high but the cost of ending poverty would be very small. This would distort the result. One way to correct for this might be to use the poverty gap in the numerator. By that metric the egregiousness of poverty has increased by a factor of 2.25 since 1990. For some time now I have been mulling over what to say about the upcoming strike by the University and College Union. I know it must be frustrating for you, to have your education disrupted like this. I know that some employers have chosen to cast this as a selfish act by staff more interested in defending their pensions than in teaching their students. Nothing could be further from the truth. To understand why, you need to know that what is at stake here is not really pensions. What is at stake is the public university itself. When tuition fees were introduced a number of years ago, faculty across the nation raised their voices in loud dissent. We joined our students to march in the streets, day after day, facing down lines of aggressive police. We did it because, like our students, we fundamentally rejected what fees do. They commoditize education, they render students as consumers and put them at financial risk. They individualize and atomize, and they break down the solidarities that underpin the university as a public good - as a commons. The present crisis is just the latest wave of the same broad attack on the public university. First it was fees, now it's pensions. The privatization of pensions places lecturers at financial risk, and severs the social contract we have with the public. You see, we lecturers are public sector workers, and we are paid as such. Most of us could earn double or triple in the private sector, but we choose to take low salaries because we believe in our jobs, we believe in our students, and we believe in the value of public education. It is a moral decision. The social contract we have with the public is that in return for this service we will get stable retirement. We will never be rich - quite unlike the management bosses who take home salaries in excess of £300,000 a year - but we can rely on a modicum of decency in old age. It is part of our collective commons. Now that is being severed. First with students, now with lecturers, our commons are being enclosed and we too are being made into objects of financialization and risk. As I see it, we are in this battle together. Just as we stood with your predecessors to fight the imposition of fees, we now ask you to stand with us to fight this latest attack on the public university. But we should not simply be defensive about this. On the contrary, we should seize the offensive. Instead of just demanding that they leave the pension system alone, we should demand that they abolish tuition fees too. Let us bring that battle back. Let us make it clear that we see these struggles as connected. Let us demand the full restoration of the public university, and reclaim our commons. The truth is that you students have much more power than staff do. The administration doesn't care if we strike. They only care if students get upset. And get upset you should! There are many things you can do. You can join the picket lines. You can write to the members of the Senior Management Team to express your opinions. You can demand a refund of your tuition, leveraging the logic of fees against those who have imposed them. And - possibly best of all - you can get your parents to phone the administration. There are many other tactics I'm sure you'll come up with yourselves. New student movements across the world - from Chile to South Africa - have recently staged successful campaigns for public education. We can join them - and we can learn from their tactics. I am reminded of that quote I shared with you from Angela Davis at the beginning of the term. "You have to act as if it were possible to radically transform the world. And you have to do it all the time." After all, power has never ceded anything without a demand. If we want to reclaim the public university, we'll have to fight for it. Together.